We manufacture a fine quality of termonalia Arjuna which is used for its medicinal properties and its curative properties in heart functions including angina, hypertension and deposits in arteries. 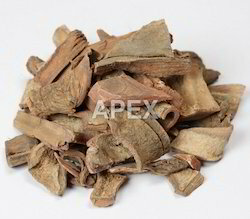 It is also a , cardio tonic, and used for ulcers, cough, tumor and excessive perspiration. Terminalia arjuna is a tree up to 25 meter hight. It grows along the river banks, plains of northern India. There are over 100 species widely distributed in the tropics (Terminalia originated from Latin ward Terminus, alluding to the leaves being borne on the tips of the shoots). In India, Terminalia chebula, T. bellrica and T.
We offer high quality terminalia arjuna / arjuna myrobalan / arjun churna which is known as tonic, astringent and cooling medicinal product. It is mainly prescribed in heart disease. It is considered to be asmari-hara or lithontripic. Externally, it is used in the form of an astringent wash to ulcers. We are suppliers of Arjun bark and its powder. Contact us if you are interested. - Arjuna has an astringent effect which acts to detoxify the blood. Its homeostatic properties help to relieve bleeding conditions and control aggravated pitta states. - The general cleansing effect of this herb helps to cleanse urinary infections like UTI. We are bulk suppliers of arjuna bark/Terminalia arjuna Bark.Feel free to send your bulk inquiry. Arjuna: A Herb At The Heart Of Your Health!